First off, how is Perseus 5.0 different? Why is it such an exciting project? Well, because now the Perseus Project is alive! Perseus 5.0 allows for almost immediate inclusion of new materials, and it’s flexible and extensible so that it can host a range of born-digital reading experiences. Plus, the project is open source and the code is hosted on GitHub, making it easy for people to contribute to the project. Furthermore, there are many ways to contribute to the project even if you don’t know anything about programming, including improving the texts in the Open Greek and Latin Project and translating the viewer into other languages. Perseus 5.0 is meant to be a truly collaborative and community driven platform, just the way that Ross Scaife would have wanted it to be. While I’m excited to see what the community will come up with for the new viewer, the first version is a pleasant reading experience. 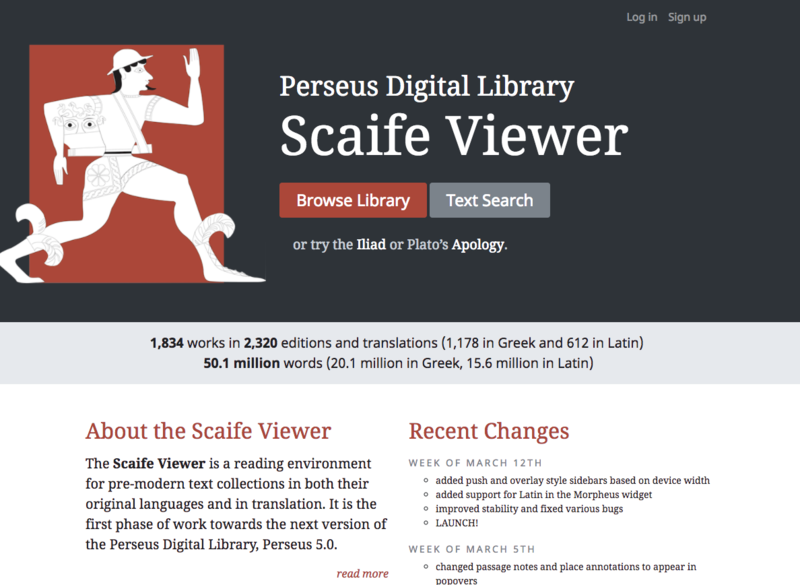 Let’s dive right in to the Scaife Viewer’s main page. Front and center are two main options for engaging with texts: Browse the Library and Text Search. At the top you can log in or sign up (more on this later). I encourage you to read the About section and check out the Recent Changes to see what new and exciting things are coming to the project. If we click on Browse the Library we are taken to a page that lists all of the available texts. We can sort the texts by text group, CTS URN (more on this later), or work. 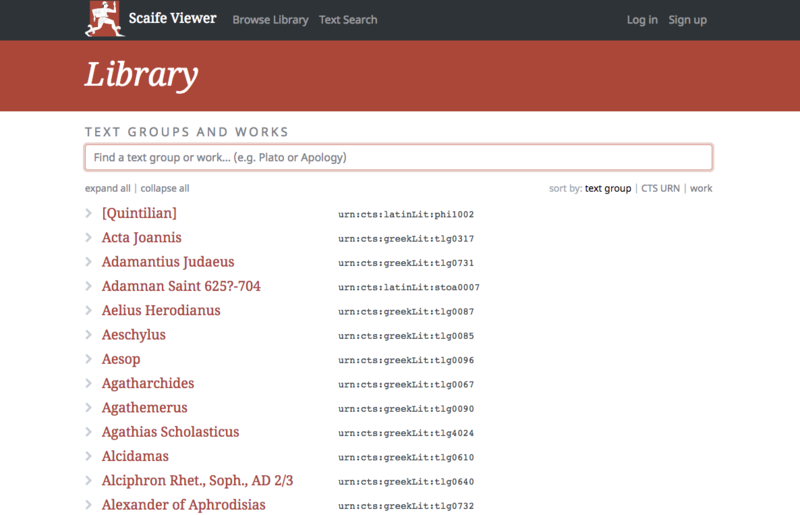 Text groups are largely authors but also include collections of texts like the Hebrew Bible, the New Testament, and various scholia. Sorting by work results in an alphabetical list of texts available on the site. The fastest way to find a text is to start typing a search term in the box. The search auto-populates once you type even one letter and it only takes three letters to find Cicero. 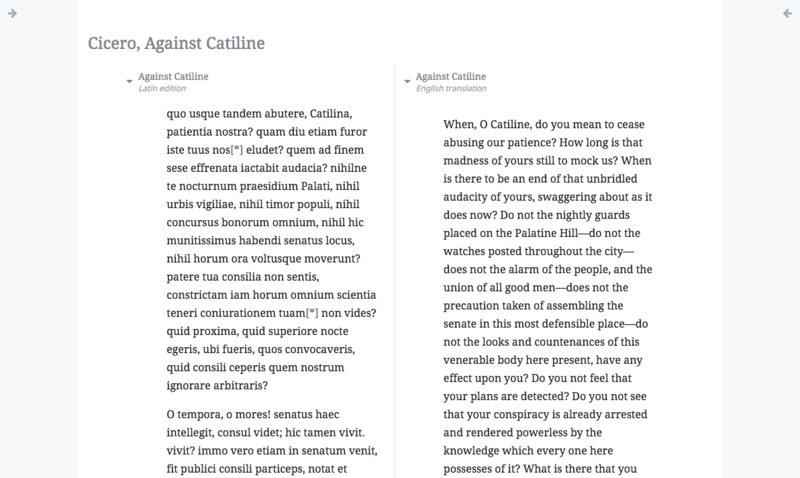 Suppose I’m in the mood for the Catilinarians: if I click on Against Catiline it brings me to a page that lets me choose from the available versions. You’ll note that there is one edition of the Catilinarians in Latin and one translation of the text in English. 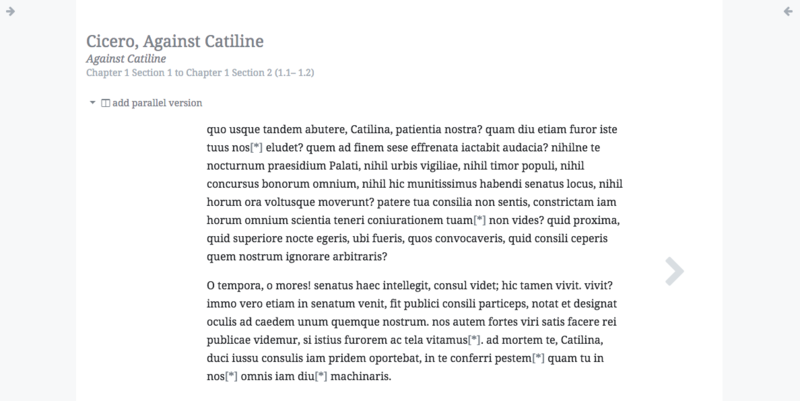 Let’s start with the Latin edition and take a look at the reader interface in detail. The main reading interface has three panels. The left-hand panel provides navigation and a text search, the center panel contains the text, and the right-hand panel is for reading options. Note that you can collapse the side panels by using the small grey arrows at the top of the main section. When the panels are collapsed, the arrows change directions and clicking on them again brings the panel back out. You can also add a parallel version of the text to the center pane. The right-hand pane (numbers 4-8) give you reader display options. Each of the individual sections can be collapsed by clicking anywhere on the section and then expanded by clicking again. The CTS URN information (#4) links to the actual xml file (see below), and the text size section (#6) lets you make the text in the reading pane larger or smaller. You have two options in the reader for Text Mode (#5): normal and highlight. Normal mode lets you easily copy/paste selections of the passage. Highlight mode lets you click on individual words and phrases to show you the morphology of the word (#7 and #8 – see below). You can see in the image above that there are grey bars to the left of the passage. Those bars are only visible when your mouse cursor moves over them. They show you the section of the text where you’re currently reading. The large outer left bar represents the entirety of the First Catilinarian while the inside bars represent the individual sections. You can click on them to navigate to other sections. If you mouse over the edge of the reading pane on the right side, a grey arrow will become visible. You can use that arrow to move forward in the text. If you are somewhere in the middle of the text, you can move your mouse left of the grey bars and a back arrow will appear, allowing you to click back to the previous section. I noted above that there are two text modes: normal and highlight. 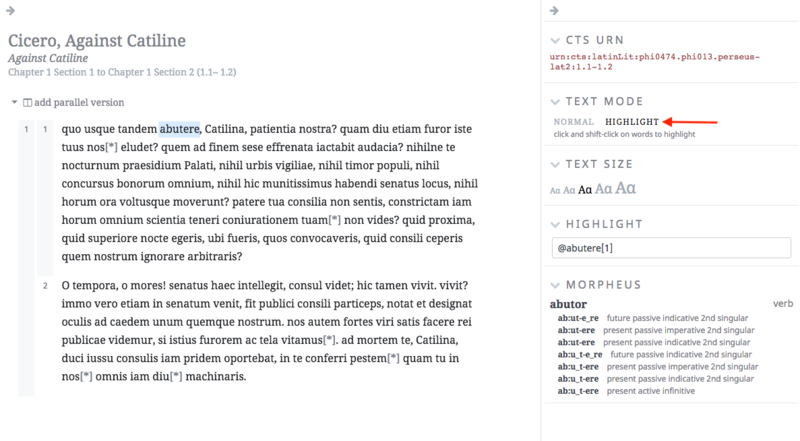 If you select highlight, you click on the word and that word will show up in the highlight pane box (you can also type words directly into the highlight box, even while using text mode normal) and the Morpheus section will populate with the morphology. Holding the shift key while you click let you select more than one word. The Morpheus section provides all of the forms for the selected word and gives you the part of speech (in this case it conjugates abutor and tells you that it’s a verb). 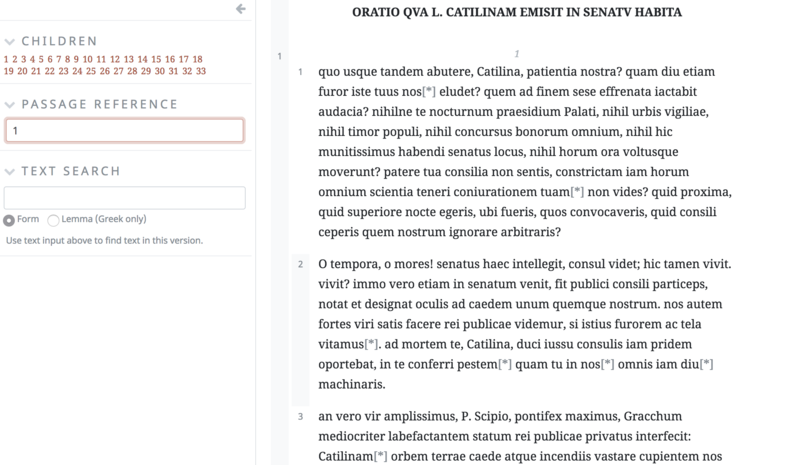 You can also add a parallel version to see both Latin and English texts side by side. If you click the arrow next to add parallel version you will see a dropdown menu listing available versions. You can see that there is an English version available, listed first, and underneath is the Latin version that we are already looking at, marked as focused by a grey sidebar. Clicking on the English text loads it right next to the Latin and you can collapse both side panels to get a better look. To remove the column, click on the version you want to remove and select remove column (in red at the bottom of the list). 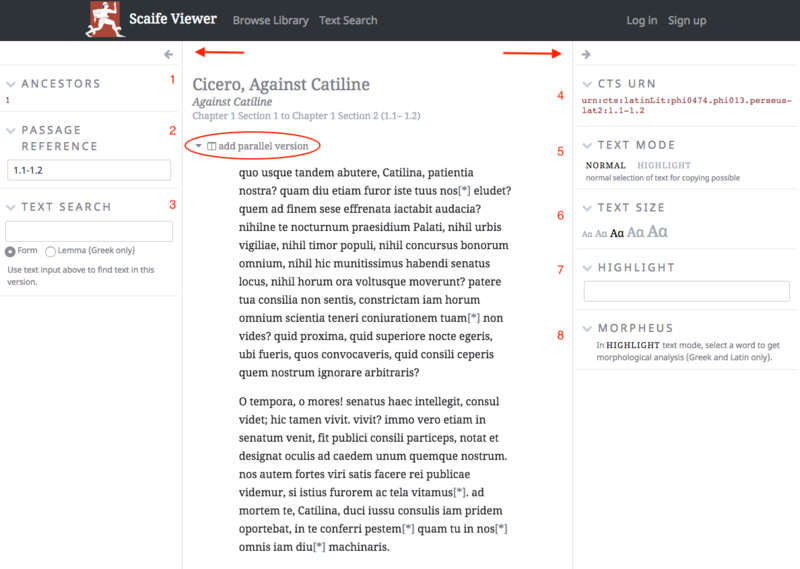 You can also change which version appears in that pane (if there was more than one English translation available, you would switch between them by clicking the title and then selecting the desired translation from the dropdown list – note that the currently focused texts are represented with grey sidebars). Last but not least is the CTS URN section (#4 in the figure at the top of the post). CTS URN provides a reference to a text or a passage of a text that is permanent (as in stable and won’t change) and canonical (so that the reference means the same thing everywhere) that can be used to retrieve the text. Check out the CTS URN overview to read more. If you click on the passage link, you will get the XML for that particular passage. XML, or eXtensible Markup Language, is a simply a format for storing and transmitting data. When you ask for a passage by the CTS URN (clicking on the link generates the request), you will get back the response above. The first part is the request that you sent. 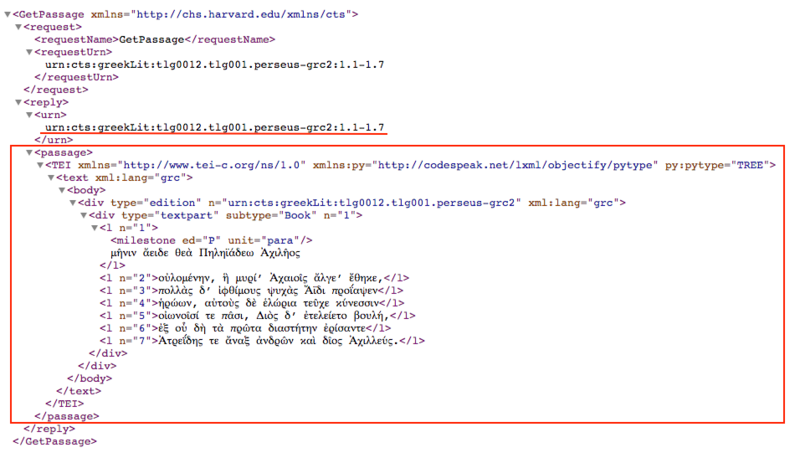 In the <requestUrn> tag is the CTS URN that you clicked on from the Perseus 5.0 page. In the reply, the passage reference is repeated in the <urn> tag, followed by the passage itself (with some accompanying metadata). Anyone can take the CTS URN response and build something with it. By using the CTS URN, Perseus is also allowing for integration with other sites that use the CTS URN system. The new Perseus 5.0 Scaife Viewer is off to a great start. I’ll have some more posts in the coming weeks about the other features (text searching and signing up) in addition to suggestions for how to get involved in the project. In the meantime, you should play around with the reader and think about what features you’d like to see next (and maybe even check out the Ways to Contribute page).